The Rocca of Tentennano crowns a rocky crag upon the medieval suburb of Rocca D'Orcia in the Val D'Orcia, province of Siena. It can be reached from the chief town following the SS2 'Cassia' turning to the right when finding the indications for Rocca D'Orcia/Castiglione D'Orcia. The first document which testifies the existence of a settlement in this area dates as far as 853 AC Three centuries later, middle of 12th century, Tentennano is in the possession of the Tignosi feudal family, who in 1207 granted a new statute called "Charta libertatis" to the population which, other than regulating the relationships with the community, acknowledged numerous rights. This act is of fundamental importance in Italian medieval history both for its contents and for the learned style (it starts with a reference to the Roman civil inheritance) and testifies the importance that this place had. 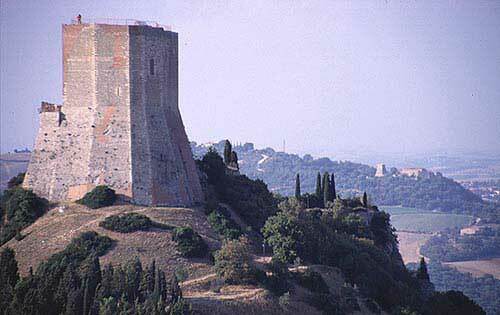 Meanwhile, the city-state of Siena was increasing pressure until 1250-1258 when they enter in possession of this castle. Immediately work was carried out to fortify the area. The stones of the fortress were consolidated and a new tower was built to replace the old broken one. But the period of greatest glory had yet to come. In 1274, together with other areas of the Val D'Orcia it was given to the Salimbeni feudal family. It was part of this powerful family's estate for all the 13th century until a deep feud began between Siena and the Salimbeni. The Tentennano (also called Tintinnano) fortress was chosen by the family to be their stronghold and here they tried to obtain the city's power. The fighting ended on 22 September 1419 with the surrender of Cocco Salimbeni, the obstinate upstart of Siena who was exiled and deprived of his possessions. The fortress was once again under Sienese control. It was to be used for military purposes for the last time in the middle of 16th century which saw the city-state of Siena annexed to that mightiest of Florence. On this occasion, as at the time of Salimbeni, it was conquered thanks to the treachery of some troops who opened the gates. Tentennano was never won by force and was occupied only after the surrender of its defenders. After this date the fortress was situated within the Tuscan Gran Duchy and, with the advent of the new fire arms, it lost its defensive function and was gradually abandoned. The defensive system of Rocca D'Orcia with its Rocca of Tentennano consists of a series of walled enclosures, designed to benefit from the ruggedness of the environment, which had to be progressively overcome by eventual assailants. A first walled circuit (with large areas still well conserved today) enclosed the village of Rocca D'Orcia (which rises at a lower level) and joined it to the fortress. Going back to the entrance gate we can see the ruins of a gate which opened onto the second walled circuit that enclosed the area on which we are now standing. In this area, which is now covered by grass, there once were buildings, streets and squares. Little of this remains today apart from a few walls but the existence of these structures were documented until two centuries ago and perhaps a carefully studied excavation could give us even greater information. Arriving at the extreme north of the plateau we have a splendid view of the OrciaValley. Going up the series of steps, we get to the mound on our left where we can see the ruins of the second walled circuit and another defence structure. The mound consists of a pentagonal area deprived of plants enclosed by a wall where we can still see traces of battlement and part of a rock outcrop of the hill. This area, used exclusively for military purpose, was reached by a gate of which no traces remains. A walled hollow is found at the centre which may have been the powder magazine. From the little court of the mound a metal stairway, installed during the recent restoration parallel to the original ones which were cut out of the thick wall, allow us to reach the walk on the surrounding wall and to enter the tower. Originally there was a movable stair which could be pulled up in case of attack. The powerful large tower has a pentagonal form, two floors and is made enclosing the last outcrop of rock. This besides being an observation post also served as keep. The only access to the keep, originally the stair was in wood. Before entering the tower, we can admire the other arch openings and the beautiful limestone wall face of which the whole fortress is built. Passing through the arch-door and along a L-shaped corridor (whose narrowness was another obstacle to the besieger) we come to the first internal zone of trapezoidal form, where, about five meters above the court level, the rock appears. The zone is covered by a great barrel vault supported by a large arch in the centre. There are three narrow loopholes cut out of the three meters thick walls. A metal stairway (the original was in stone with the final part in wood and removable) takes us to the upper area divided in two zones. The first zone of irregular shape is covered by a large barrel vault supported by two transversal arches and is illuminated by two windows cut out of the wall. A small corridor takes us to the other zone again covered by a vault. On the floor is the entrance to a huge cistern whose depth is lower than the level of the first floor (see section) which collects rainwater and provided water supply for the fortress. On the left wall an oven was cut out in the stone. Returning to the second room a metal stairway (originally in wood) through an opening of the vault allows us to get to the above terrace. A majestic view of the OrciaValley, the AmiataMountains and the surrounding area greets us. Nearby there is the village of Rocca D'Orcia which has conserved the original medieval urban structure. Here you'll find a charming square with a central cistern, religious buildings and a small but rich country culture museum.